Welcome to a new world, where Donald Trump is president, Britain is out of Europe and further political shocks are on the horizon. (Right wing French leader Marie Le Pen is tipped to be their next President). It seems however that not only has social media played a large part in the results of this historic election, but a random group of young men from Macedonia could have influenced the result. Major political shifts are fuelled by people; people rely on legitimate news sources to help them make an informed decision. The way people ingest news has dramatically changed, even since Obama took office. Social media is now a huge player when it comes to political discourse and has been used effectively to spread information faster than ever before. Unfortunately, this seems to have been exploited in this US election. Eagle eyed chancers have spotted lucrative possibilities by taking advantage of the vociferous and divisive passions of politics on social media. They have been promoting false and unproven news stories, designed to be shared for maximum engagement, the high traffic volumes are then shown advertising on the host site. This model has become especially prevalent during this year’s US election due to the heightened level of interest and a divisive campaign. One of the biggest websites which blurs the line between truth and lies is the National Report. It creates hyperbolic or even plain false stories, before widely sharing them on Facebook. The key seems to be around a potent headline and picture acting as clickbait. 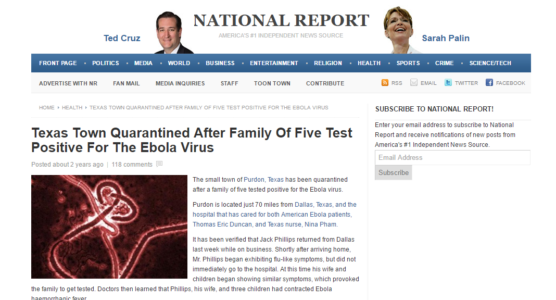 One of its most successful stories was about a town in the USA which had to be quarantined in an Ebola scare. (Not true). It is not just Americans who are benefiting from this new tactic though. 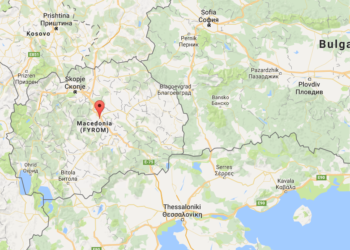 A small town in the Balkan nation of Macedonia has become the hotbed for viral Trump news. Veles is the sight of a digital gold rush with over 100 sites dedicated to Trump and the 2016 election. All of this entrepreneurial spirit is coming from young adults, often just students, looking to make quick cash. These sites promote aggressively pro-Trump rhetoric aimed at American conservatives in the hope of it igniting engagement en masse. US Facebook users and their clicks are worth four times that of users outside the states. The sensationalism plays into how social media culture works with something able to spread much faster before any questions can be asked about it’s validity. Winston Churchill famously said “A lie gets halfway around the world before the truth has a chance to get its pants on”. He never foresaw the issue with this in a digital world. Before anyone has time to fact check, the most popular stories create enough traffic that these young digital gold miners benefit, usually via AdSense or 3rd party advertising. Some in Veles claim teenagers are earning £5,000 a month and even £3,000 a day if the story is particularly popular and viral. What Has the Effect on Politics Been? These fake stories may not have any direct effect on specific outcomes, but it seems to have justified many beliefs perpetuating a long term problem and effecting how people have been voting. A sensationalised story reinforces people’s held beliefs, which might have already been proven false. It confirms prejudices that are held that could otherwise be changed via reputable news reporting. Instead their beliefs are made more concrete and changing their minds is a much more difficult prospect. This can be seen in the unwavering support Donald Trump has had despite numerous scandals which would have brought down any other candidate. So while many will be reeling from one of the political shocks of the century, it could be that not only is our politics changing, but also our news. Don’t believe everything you read in the papers is a saying that is quickly being appropriated by the internet!